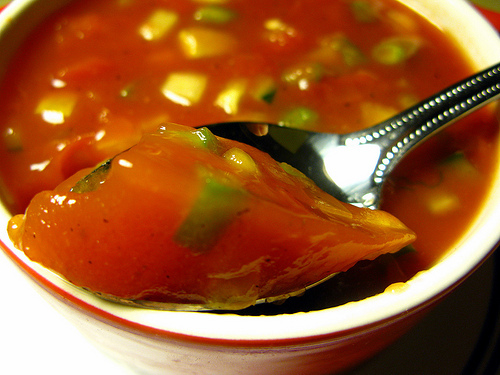 Nothing melts away winter’s cold better than a piping hot bowl of soup. Even the smallest amount of vegetables and meat simmered in a rich broth and dotted with rice, pasta, barley or beans can make a satisfying meal. Whatever your taste, a few simple tips will start you down the path to creating delicious filling soups. Break out of your box—experiment. Find a recipe that peaks your interest and tweak it to fit what you have on hand or what your nose and taste buds tell you to cook. Try using an immersion blender to create creamy soups without the need for high fat heavy cream. Or, blend only half the soup, leaving the other half chunky. Use vegetables you have on hand; root veggies in winter, asparagus in spring, tomatoes in summer and squash in fall. Soups adapt well in any season. Keep a well stocked pantry with staples like onions, garlic, spices and herbs, broth, rice, beans and barley, and you’ll never be far from a hearty bowl of soup. Cook down chicken carcasses and beef bones into homemade broth and freeze to use later as soup base. Garnish soups with fresh herbs, croutons or shaved Parmesan cheese and pair with a salad and some crusty home baked bread for a simple elegant meal. Whether you fancy a roasted mushroom soup, a spicy red pepper or a smooth herbed tomato soup start your recipe search (and collection) today.